Working with peripheral blood mononuclear cell (PBMC) samples can be tricky. 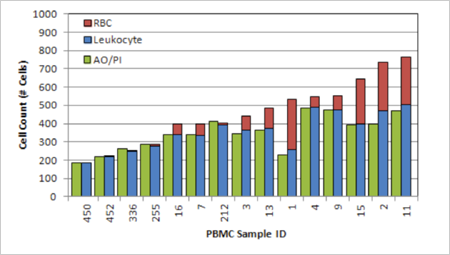 Many PBMC users currently use a hemacytometer and light microscopy to manually count their PBMCs. However, standard light microscopy cannot consistently distinguish between leukocytes and red blood cells (RBC). As a result, this manual method can result in an over-reported concentration and viability determination of the sample. Additionally, the biconcave shape of RBCs can only be identified with a special optical setup, focusing technique and trained operator. Another challenge with PBMC samples is there tends to be a wide variation from sample to sample in the degree of RBC and platelet contamination. This adds to the difficulty to have one set of conditions to count PBMCs and measure viability quickly and simply. In cancer immunotherapy, leukapheresis is often used to isolate immune system cells from a patient’s blood. Cells are then expanded or exposed to different agents depending on the vaccine design. Active cells are then infused back to the patient. Cell concentration and viability are essential parameters to monitor throughout the manufacturing process. 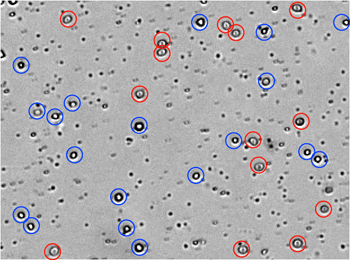 From the captured bright field image manual identification of RBCs (circled in red) and white blood cells (circled in blue). 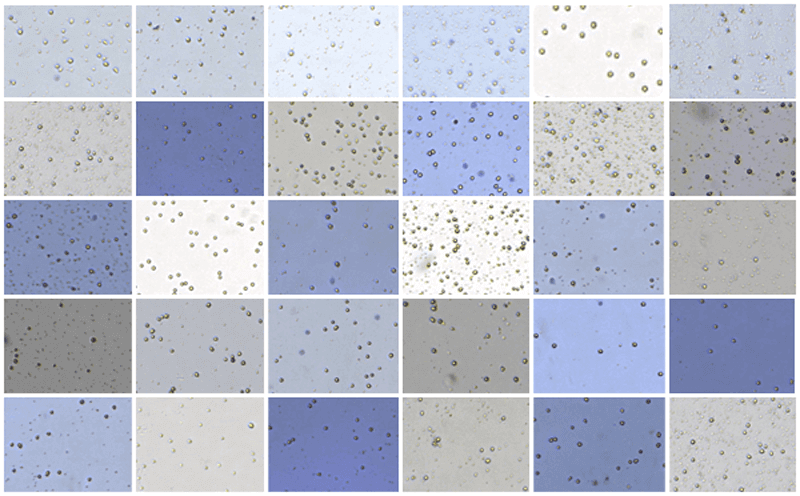 These residual RBCs can lead to an inaccurate count during manual counting of PBMC samples. Nexcelom has optimized a dual-fluorescence staining method for simple, accurate determination of PBMC concentration and viability. 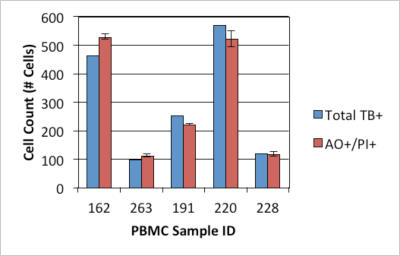 Samples stained with AO/PI can be analyzed with the Cellometer Auto 2000, K2 or Vision instruments using pre-optimized settings for PBMC analysis. B. 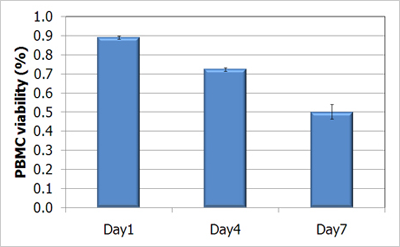 Compare AO/PI cell count to RBC and Leukocyte count performed earlier. 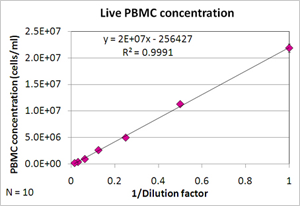 PBMC was measured from live cell concentration of 2×107 to 2×105. The Cellometer Auto 2000 Cell Viability Counter , Cellometer K2 and the Vision / Vision CBA Image Cytometry Systems are optimized for accurate analysis of PBMCs in samples with RBC contamination both pre- and post-cryopreservation. Both systems can also be used to determine TNC concentration and viability in fresh blood samples prior to Ficoll separation. Current PBMC enumeration method using Hemacytometer and light microscopy can include donor-dependent RBC-induced counting error. 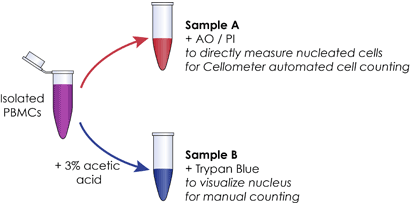 Cellometer image cytometer was used to eliminate the RBC-induced counting error by automatically enumerate AO/PI-stained nucleated cells. “Cell loss and recovery in umbilical cord blood processing: a comparison of postthaw and postwash samples”, V. Laroche, D. H. McKenna, G. Moroff, T. Schierman, D. Kadidlo, and J. McCullough, Transfusion, Vol., 45, Dec. 2005. “Viability and Recovery of Peripheral Blood Mononuclear Cells Cryopreserved for up to 12 Years in a Multicenter Study”, C. A. Kleeberger, R. H. Lyles, J. B. Margolick, C. R. Rinaldo, J. P. Phair, and J. V. Giorgi, Clinccal and Diagnostic laboratory Immunology, Vol. 6, No. 1, Jan. 1999. Chan, L.L., Wilkinson, A.R., Paradis, B.D. and Lai, N. (2012b) Rapid Image-based Cytometry for Comparison of Fluorescent Viability Staining Methods. Journal of Fluorescence 22, 1301-1311. Almeida, C.-A.M., Roberts, S.G., Laird, R., McKinnon, E., Ahmed, I., Pfafferott, K., Turley, J., Keane, N.M., Lucas, A., Rushton, B., Chopra, A., Mallal, S. and John, M. (2009) Automation of the ELISpot assay for high-throughput detection of antigen-specific T-cell responses. Journal of Immunological Methods 344, 1-5. Constantino, B.T. and Cogionis, B. (2000) Nucleated RBCs – Significance in the Peripheral Blood Film. Laboratory Medicine 31, 223-229. Laroche, V., McKenna, D.H., Moroff, G., Schierman, T., Kadidlo, D. and McCullough, J. (2005) Cell loss and recovery in umbilical cord blood processing: a comparison of postthaw and postwash samples. Transfusion 45, 1909-1916. Sigfusson, A. and Souhami, R. (1984) The Effects of Erythrocyte Contamination on Pokeweed Mitogen Induced Immunoglobulin-Synthesis in Man. Journal of Immunological Methods 72, 167-170. Szabo, S.E., Monroe, S.L., Fiorino, S., Bitzan, J. and Loper, K. (2004) Evaluation of an Automated Instrument for Viability and Concentration Measurements of Cryopreserved Hematopoietic Cells. Laboratory Hematology 10, 109-111.